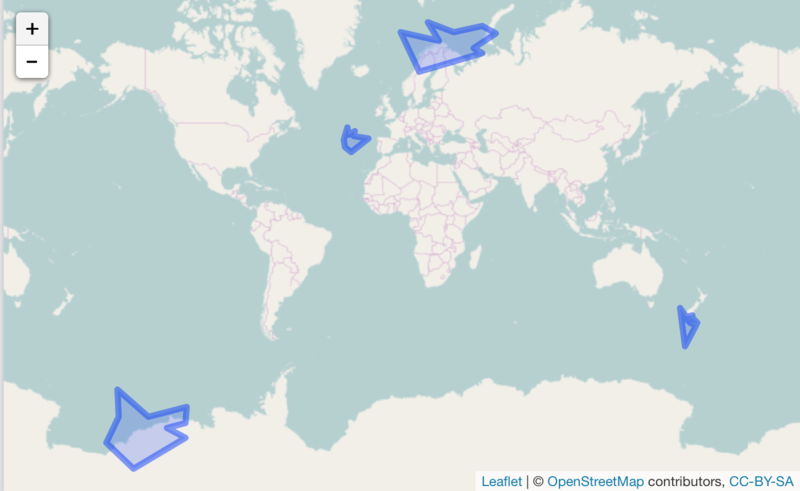 Generate random positions (latitude/longitude), Well-known text ('WKT') points or polygons, or 'GeoJSON' points or polygons. randgeo generates random points and shapes in GeoJSON and WKT formats for use in examples, teaching, or statistical applications. Points and shapes are generated in the long/lat coordinate system and with appropriate spherical geometry; random points are distributed evenly across the globe, and random shapes are sized according to a maximum great-circle distance from the center of the shape. randgeo was adapted from https://github.com/tmcw/geojson-random to have a pure R implementation without any dependencies as well as appropriate geometry. Data generated by randgeo may be processed or displayed of with packages such as sf, wicket, geojson, wellknown, geojsonio, or lawn. Random point - evenly distributed across the sphere. The bbox option allows you to limit points to within long/lat bounds. Random linestring - starting from a random point, with default maximum segment length and maximum rotation between two segments. Visualize your shapes with lawn. #>  "LINESTRING (42.7817546 19.4598109, 42.7818265 19.4597713, 42.7819039 19.4597543, 42.7819206 19.4597476, 42.7819732 19.4597341, 42.7820674 19.4596920, 42.7821133 19.4596554, 42.7821233 19.4596390, 42.7821761 19.4595728, 42.7821867 19.4595509)"
#>  "POLYGON ((-164.5191674 48.1392788, -160.7019535 50.0321237, -162.9547961 47.6318361, -154.1477728 46.2428280, -164.4173904 45.9485672, -160.5131717 43.5274697, -167.1833639 41.2046996, -164.5419419 45.9658491, -171.4209181 42.8764619, -166.7761058 46.2084577, -164.5191674 48.1392788))"